HP Umpire Brian Knight ejected Athletics CF Sam Fuld and Manager Bob Melvin for arguing an interference (runner's lane) call in the top of the 5th inning of the Athletics-Orioles game. With two out and none on, Fuld bunted a 0-0 fastball from Orioles pitcher Chris Tillman on the ground to catcher Caleb Joseph, who threw to first baseman Chris Davis. 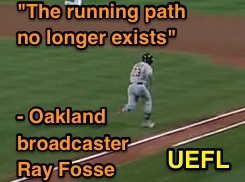 Replays indicate Joseph's throw hit Fuld and that Fuld had run the entire distance from home plate to first base in fair territory and outside of the runner's lane at 45-feet, the call was correct. * At the time of the ejections, the Orioles were leading, 3-1. The Orioles ultimately won the contest, 4-2. These are Brian Knight (91)'s first and second ejections of 2015. Brian Knight now has 7 points in the UEFL Standings (-1 Prev + 2*[2 MLB + 2 Correct Call] = 7). Crew Chief Ron Kulpa now has -4 points in Crew Division (-6 Previous + 2 Correct Call = -4). Replays indicate Fuld ran on the infield grass. *Relevant Rule: 5.09(a)(11) (2014 OBR Rule 6.05(k)): Batter is out when, "In running the last half of the distance from home base to first base, while the ball is being fielded to first base, he runs outside (to the right of) the three-foot line, or inside (to the left of) the foul line, and in the umpire’s judgment in so doing interferes with the fielder taking the throw at first base, in which case the ball is dead." The rule's comment permits the batter-runner to exit the three-foot lane "in the immediate vicinity of first base for the sole purpose of touching first base." However, all interpretations of this rule state that the batter-runner loses the protection afforded by the comment if he had not been running in the lane to begin with (e.g., if he never actually "exited" the lane because he wasn't ever within the lane; the courtesy of protection is only afforded to runners actually exiting the lane). Jim Evans: "A runner who has advanced the entire distance from home plate to first in fair territory making no effort to run within the lane is not extended the same leniency as the runner who runs in the lane as required and then cuts into fair territory near the base to touch it." Harry Wendelstedt addresses quality of the throw: "The determination is not whether the throw is true, but whether it could still reasonably retire the runner." These are the 164th and 165th ejections of the 2015 MLB Regular Season. This is the 74th player ejection of 2015. Prior to ejection, Fuld was 0-3 (SO) in the contest. This is the 77th Manager ejection of 2015. This is the Athletics' 4th ejection of 2015, 3rd in the AL West (HOU, SEA 5; OAK 4; LAA, TEX 3). This is Sam Fuld's first career MLB ejection. This is Bob Melvin's 3rd ejection of 2015, 1st since July 22 (Hunter Wendelstedt; QOC = Y [Balls/Strikes]). This is Brian Knight's first ejection since August 7, 2014 (Matt Kemp; QOC = Y [Check Swing]).